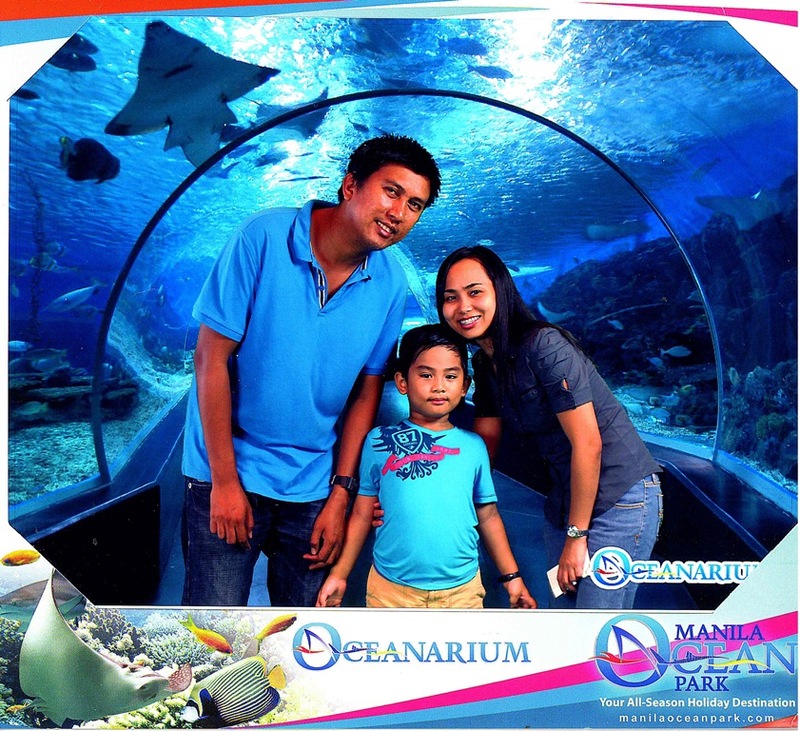 October 13th, Saturday; off we went to Manila Ocean Park for our Ultimate Acquatica adventure. It's actually our 5th year Wedding Anniversary and both decided to have another fun and educational trip for our preschooler. I availed Metrodeal's voucher for Ocean Park's Nine Fun attractions which give us 63% OFF the original price. We arrived at the park 15min. before 10am, just in time to redeem my tickets by simply presenting printed vouchers and valid ID at the Acquatica Pool Entrance. Afterwards, we went ahead to watch the Sea Lion Show that starts at 11am. The show was followed by 2pm and 4:30pm, your choice! Watching the 1st set was just on time to eat lunch right after. Sealions, Vincent and Sandra entertain us with their charm and intelligence! love their dancing and audience interaction. One thing I don't like about the show organizer is that right in the middle of the show, they allowed bulk of people (whose on a school field trip) to come in, giving us just a view of all those people endlessly walking in, completely blocking all of us in the front row. I mean, they should be considerate enough to think of us who strictly followed the time schedule to have our seats and not just to be blocked and annoyed by those who comes in late. arggh! After lunch, we headed back to the Acquatica Centre, (same venue just near the Park entrance) to watch the All Star Bird Show at 1pm. You can shop for souvenirs at the store located at the left side of the Acquatica Centre and another one inside the park. Enjoyed watching birds trick and friendly competition and the host ask some audience to have a chance to interact up-close! 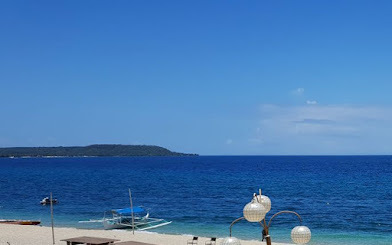 I'm quite sure that the host was referring and looking at me when he said that the lady in shades wearing gray to come forward and participate for the next trick, I was about to go leaving my things to husband when the lady in front of me stand-up and all smiles went down getting my turn. She's wearing shades and light gray shirt alright, but in polka dots print, in polka prints! The host never mentioned the lady in polka, pls??? My sister posing for cam while playful son intentionally tries to ruin a perfect shot. 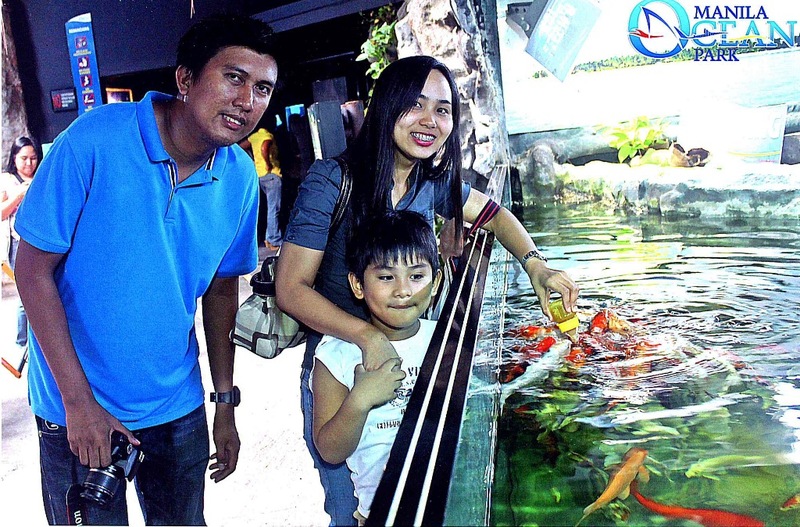 Family picture, studio shot where they photoshopped the oceanarium background, the price? its 300 pesos! This attraction is what I enjoyed the most! A walk-through exhibit where you can learn more about frozen wilderness. My sis and I enjoyed the 42 meters ice slide at Slide O' Fun. Sorry son, 4ft. below is not allowed. Yihee... our turn! And we never missed a chance to have a close encounter with them. Penguin feeding for additional fee of 500 pesos where it includes captured photos in CD. Go directly to Snow Village to freeze! More pics to satisfy certified camera addicts! You have to hold the bottle tighter, because these fish can quickly get the bottle out of your hands. Before the show starts, they distributed a free disposable raincoat to all, for us not to go home in wet clothes. 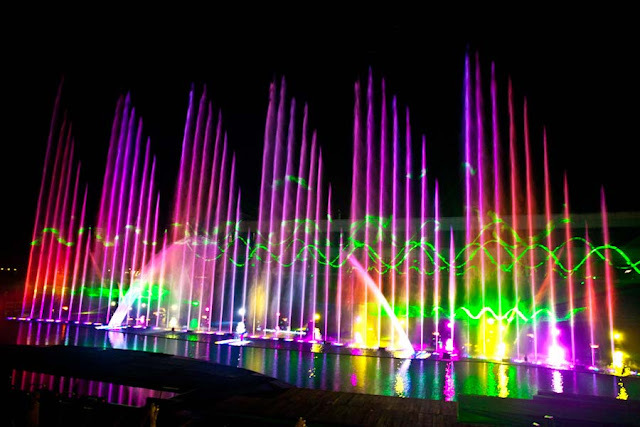 30 minutes display of fire, laser lights, and music, backed by animated sea characters on water screen. A truly breath taking musical display! And that's THE END of our Ocean Adventure, it was really a recommended fun place for all ages. Yes, we did! 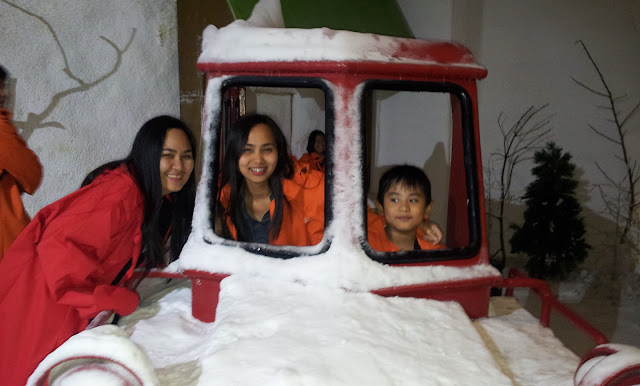 The first time we went there when it was newly opened. My B was just 6mos. old at that time. Glad they add more attractions to spent an entire day at the park. i am so happy that you had a nice time. i am researching about metrodeal and i have read good and bad reviews. 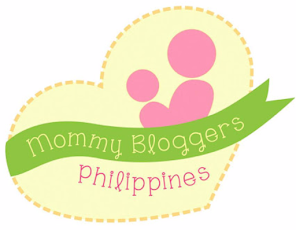 i also read this article http://blog.rainingpesos.com.ph/online-shopping-and-how-to-detect-a-scam-metrodeal-zalora-ewine-reviews-and-more/. anyways hoping to make a purchase from them soon and ill let you know how it turns out. Thanks for the link. Actually I've been a fraud victim once. The site is cleverbuy. I had purchase 3 sessions of diamond peel, turns out the site owner disappear after collecting money. The spa owner let me use my paid voucher for just 1 session, as explained, they did not receive any payment from the site and they are victim as well. I use my credit card. You can have safe and secure transaction on metrodeal. Legit buying site nman sila. You should. Make the most of it, take a lot of pix and enjoy! Thanks for your review, Metrodeal is mucking me around with a CC payment so i will peruse another payment avenue due to your blog post. Which is better ensogo or Metrodeal? Hello, ate pano yung pagbook ng hotel sa metrodeal? for example sept 26 to 29 magstay dun sa hotel so 4 days yun. 4 voucher rin ba kailangan or lagay nlang dun sa quantity? hi.. im just worried if my credit card will be breached like what i have seen in some reviews.. is it really legal and trusted? Hi Dianne! So far, I haven't experienced any credit card breached when buying online. Make sure you make transactions with legit buying sites like metrodeal. Yes, they can be trusted. By the way, you can link your credit card to your paypal account to be more confident in buyin using your cc, to take advantage of paypal's buyer protection program. Hi there! Do you purchase from local internet retail sites such as Lazada, Cash Cash Pinoy, Sulit/OLX, Metro Deal and Ensogo? Hi yung voucher and valid id lang po ba yung need ipakita sa redemption booth? Yes, voucher and valid ID lang. Hi Mariel! You don't need to make a reservation. Hi i've been reading ocean park metrodeal reviews and found this. tanong ko lang, if you purchased yung tickets, kelangan ba same day gamitin agad? kasi i purchased yung 4,999 oceanpark/hotel h20 promo. ok lang kaya na the next day gamitin yung tickets for the attractions and buffet? thanks! No hidden charges po ba? Ms. Einz Ask ko lng po if... yung voucher po ba yun mismo nasa post sa metro deal.... just printed copy of it then what else po? balak ko po kasi online purchase.. through lbc or paypal...... valid id, voucher at... receipt lbc gnun kya? Hi! I paid thru my paypal account. Just print your voucher if the payment was made. Automatic na mag appear sa metrodeal account mo yung paid vouchers for printing and yun yung ipakita mo sa redemption booth together with valid ID. yung po ba metro deal voucher.. ppadla sayo after payment? i-print lang yung voucher na mag appear sa metrodeal account mo if payment was made. Hi, did you pay for entrance ticket? Or is it already inclusive in the metrodeal? If I pay today at BDO, will I receive the printable voucher today also? I plan to go tomorrow. Thank you. Yes, the voucher will appear on your account right after payment. Hi po just want to ask..kasi ibought 2 voucher for ocean park adventure..kaso hindi ko pa sya nabayaran agad..tapos im not feeling well po to go tomorrow..is there any bad consequences sa acount ko sa metrodeal kung di ko na xa iaavail? Food and drinks are not allowed, however infant formula is permitted. I've visited Manila Ocean Park twice already. But reading your post, ang dami pa pala namin hindi natry na activities. I hope I can also find a good promo for this.